Whether you’re vegetarian or not, these sumptuous vegetarian Christmas meals will impress those guests or family members who are. These meat-free dishes are so attractive they may even encourage the committed carnivores in your midst to try something a little different! One handful of fresh sage leaves, finely chopped. Wipe the mushrooms or peel if preferred. Remove the stalks, make sure they are clean then chop them. Melt the butter in a frying pan over low heat. 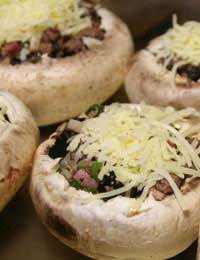 Use about half of the melted butter to brush both sides of the whole mushrooms. Place them in an ovenproof dish. Gently fry the onion in the remaining butter, then, when the onion has softened, add the mushroom stalks. Remove the pan from the heat and add the breadcrumbs, cheese, cider, chives and sage. Mix well. Spoon this mixture over the whole mushrooms and bake for about 15 minutes. This dish is a little out of the ordinary. It’s a seasonal main course that makes a change from nut roast or vegetable mornay and is worth the extra effort! Stir in the honey, spices and citrus rinds. Leave to cool slightly. Line a 20cm, deep, oven dish (or flan ring) with pastry.Pound the walnuts but don’t pulverise them! Add the walnuts, eggs and cream to the mixing bowl and stir well to combine all the ingredients. Peel the parsnips and cook in boiling water until tender, then mash them. Add the flour, egg and seasoning. Shape the mash into flat round cakes (7-8cm). Dip the parsnip cakes in the combined milk and breadcrumbs then fry them until golden brown and crisp on the outside. In a small saucepan, cover the whole aubergine with water and boil for about 10 minutes. Leave to cool then remove the skin.Mash the aubergine flesh until pureed and add the ginger, chopped chillies and a little salt. Heat the ghee (or butter) in a frying pan and cook the onion until soft. Add the garlic. Now add the aubergine and cook it all together for 10-15 minutes. Keep stirring. Serve this simple but delicious accompaniment on a warm dish and garnish with coriander.